Did you know that wine tasting in PA is one of the most exciting ways to spend your weekend? There are various vineyards that dot the central PA area, which gives you plenty of opportunities to try out the area’s finest local and regional wines. Premiere #1 Limousine Service makes it easy for you to plan weekend getaways to the most notable places, including wine tasting adventures. Enjoy a scenic Hershey Harrisburg Wine Country tour that combines great wine, great food and beautiful hotel accommodations. 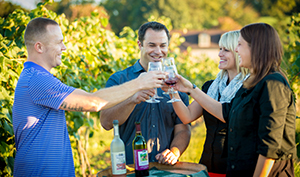 Along with our popular Hershey brewery tours, Hershey winery tours are affordable and exciting chances for couples, friends and relatives to reconnect and make new memories. Across the nation, there has been a notable resurgence of affection for local wine. Not only does sipping the area’s grape allow you to get a bit closer to what makes our Susquehanna Valley so unique, but it also allows you to support the local vineyards and winemakers. What could be a better, more relaxing way to spend a Saturday or Sunday than wine tasting throughout Hershey, PA? And with Premiere #1 Limousine, you can do it all safely and luxuriously. No Special Occasions Needed for Wine Tasting in Hershey, PA! If you thought you had to wait for a special occasion to set off on a wine tasting journey throughout central PA with Premiere #1 Limousine, think again! Our weekend getaways, including the Hershey Winery Tour package, are suitable for any celebration, including regular TGIF satisfaction. Want to surprise your special someone with a romantic weekend — There’s no need to leave the area to feel like you’ve gotten away from it all. A wine tasting tour might be just what the two of you need to relax without the stress of your everyday lives. Are looking for a way to do something completely different with your BFF — You’ve been pals forever. Why not add the memories that come with a Premiere #1 Limousine Hershey wine tour? Want to give a gift to a couple in your life who has done so much for you — This could be your parents, your children, your neighbors, your coworkers or your best friends. A Hershey winery tour package is a wonderful present that will give them a taste of luxury. Want to spend a little one-on-one time with your mom or dad — Give your parents an unforgettable weekend they deserve. Forget about the same-old spots they like to visit on the weekends. Our Hershey winery tours and Hershey brewery tours are exactly the right fit for something new, but timeless. Imagine the excitement of looking at the calendar and knowing your wine tasting fun is just a few days away! Contact Premiere #1 Limousine to set up a weekend getaway right now.